Way back in November 2014, months after The Lego Movie became a surprise box office blockbuster, directors Phil Lord and Chris Miller revealed that the spin-off they're producing, The LEGO Batman Movie, will acknowledge "every era of Batman filmmaking." It seems that the producers, and director Chris McKay have done their Batman homework, as it were, with the director announcing on social media that none other than Billy Dee Williams will provide the voice for the iconic villain Two-Face, a.k.a. Harvey Dent. Die-hard fans of the Batman movie franchise will know that this rights a cinematic wrong set in motion more than 25 years ago. Director Chris McKay revealed the news on Twitter today, when asked by a fan if Billy Dee Williams will voice Two-Face. 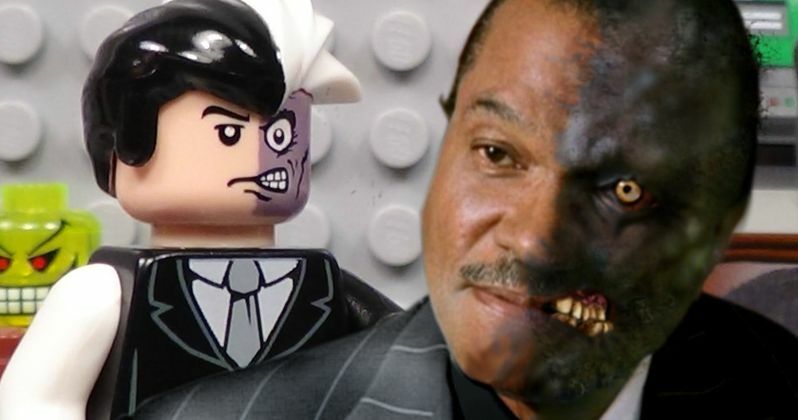 Billy Dee Williams previously played Harvey Dent in Tim Burton's 1989 movie Batman, but he never got the chance to transform into the villainous Two-Face. The actor even had a clause in his contract, reserving the Two-Face role for him, but the studio decided to cast Tommy Lee Jones as Two-Face instead for 1995's Batman Forever, so the studio bought out Billy Dee Williams' contract. Billy Dee Williams joins a cast that includes Will Arnett as Batman, reprising his role from The Lego Movie, along with Zach Galifianakis as The Joker, Michael Cera as Robin, Rosario Dawson as Batgirl, Ralph Fiennes as Alfred Pennyworth and Mariah Carey as the Mayor of Gotham. Fans got their first look at Harley Quinn in the animated movie, but the studio still hasn't confirmed who is voicing the role. It remains to be seen how many other characters have yet to be revealed. This news comes just weeks after director Chris McKay, who served as the animation director on The Lego Movie, teased that there will be a slew of Easter Eggs that fans will be able to discover, especially within the signage in downtown Gotham City. However, most of these Easter Eggs won't be discovered until the Blu-ray and DVD release next year, when fans can freeze-frame certain scenes to discover these Easter Eggs. Naturally, he wouldn't divulge what any of these Easter Eggs are, but we'll find out in just a few short months. In the irreverent spirit of fun that made The LEGO Movie a worldwide phenomenon, the self-described leading man of that ensemble - LEGO Batman - stars in his own big-screen adventure: The LEGO Batman Movie. But there are big changes brewing in Gotham, and if he wants to save the city from The Joker's hostile takeover, Batman may have to drop the lone vigilante thing, try to work with others and maybe, just maybe, learn to lighten up. Take a look at The LEGO Batman Movie director Chris McKay's tweets below, as we get closer to the February 10, 2017 release date.